The French government says it has dropped the fuel tax hike plan that has sparked massive Yellow Vests protests and eventually got suspended with a half-year moratorium Tuesday – at least for the 2019 budget. “The government is ready for dialogue and is showing it because this tax increase has been dropped from the 2019 budget bill,” French Prime Minister Edouard Philippe told the lower house of parliament Wednesday. The leader of the right-wing National Rally (NR) party, Marine Le Pen, has called on Macron to promise not to allow the canceled tax to be reintroduced into the budget in spring “at all costs”. “Indeed, the situation is too serious for us to play with words,” she tweeted. Earlier, Le Pen called for the dissolution of the parliament unless the crisis is resolved. The announcement was a part of the deal proposed by Philippe and approved by the lower house of the French parliament, the National Assembly, on Wednesday. The proposal put forward by the government envisages an array of other concessions, including the freezing of gas and electricity tariffs and a delay in the introduction of tougher car inspections. The latter measure is seen is a crackdown on diesel cars. While protesters welcomed the government’s attempt to defuse tension, it is unlikely to actually pull the plug on a wide-ranging social movement that has incorporated different causes such as the demand to raise taxes on the rich, increase in the minimum wage and overturn a controversial educational reform. Mouraud added that she expects many of the protesters to hit the streets despite the announcement, calling on them to push the government to cave in to their other demands. The protests over the tax hike that was set to be introduced in January have been plaguing Paris and other major French cities since mid-November. 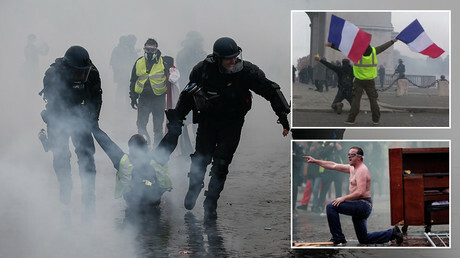 The action, spearheaded by activists wearing yellow vests, has been mired in violence and has seen over 130 people injured and at least 412 arrested. Four people, including an elderly woman, have died amid the fierce clashes between rioting demonstrators and police. The turmoil has left a trail of destruction across France, with shops at the iconic Champs-Élysées Avenue vandalized, cars overturned and torched, and the Arc de Triomphe spray-painted with graffiti.